Spaniards are serious about ham. Not only are they the biggest producers in the world of air-dried, cured pork, but they are also the biggest consumers, eating approximately 5kg. per person, per year. I feel like I’ve eaten about half that much already in the two days I’ve been here. But ham is not just one thing in Spain. There are different breeds of pigs, different curing techniques, and then within those styles, there are many grades. The title photo shows how the pricing can vary according to the product. This explains why you pay about $17.00 US for 5 or 6 slices of Iberico ham at Costco. 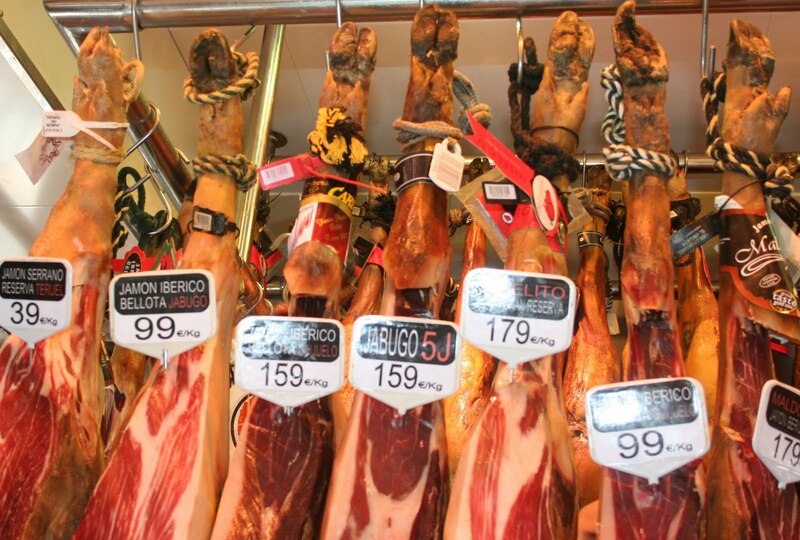 The two main types of dried ham are Jamon Serrano or “mountain ham” and Jamon Iberico from the Iberian Peninsula. 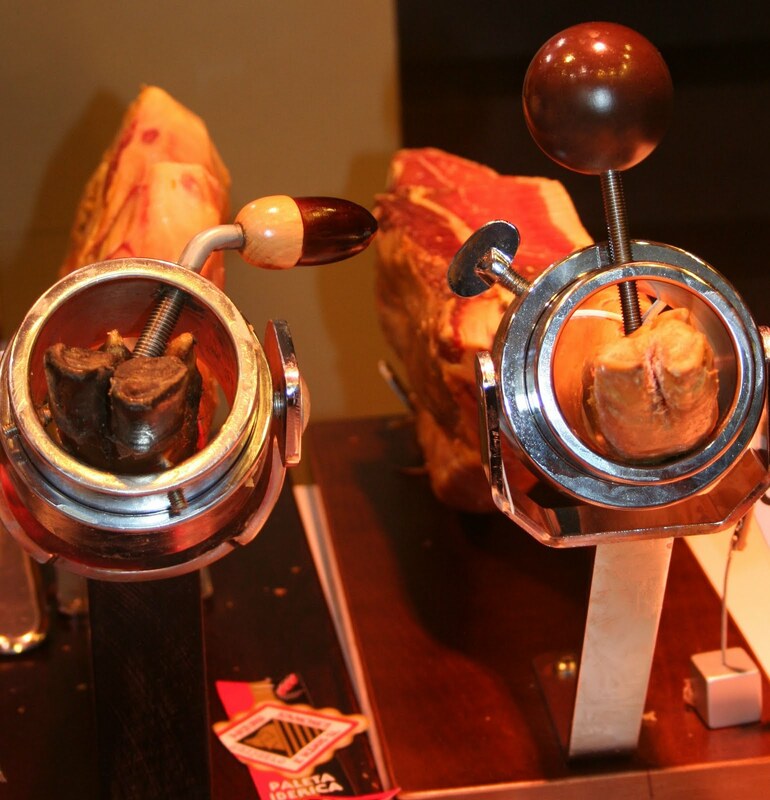 Meat, dried and cured with salt, has been in the Iberian diet since Roman times. When the Moors invaded, bringing the dietary laws of Islam, it was outlawed, but when the Christians regained control of the region, it regained popularity. So what’s the difference? The Serrano ham is made from a variety of grain fed white pigs, which are cured between 7 and 16 months. The Ibérico pig feeds on some grains, but also grazes naturally on grass and acorns among groves of oak and cork trees. The meat is then cured between 14 and 36 months. It is this exceptional breeding, care, and processing that has earned Ibérico ham the title as the caviar of cured hams, definitely distinguished as the best in the world. Technology used to slice ham off the hoof. If you have only ever eaten American style ham, this will seem like a very different substance to you. It can be dry and waxy or soft and a little chewy. Either way, it is sliced as thinly as possible. The flavor is also quite different from an American ham and may require some getting used to. About the easiest way to begin experimenting with Spanish hams is with the simple appetizer of ham wrapped melon. In the US, where we generally have the extra large, truck ripened cantaloupes, I didn’t completely get the magic of this dish. Lately in Tunis, however, we have had small, vine –ripened melons that are so sweet and flavorful that just one fills the house with its scent and rivals any other dessert you might match it against and I’m not one of those people who claims they would always prefer fresh fruit over a real dessert. This kind of melon is a worthy partner for the salt and mysterious flavors of air-dried ham. I have usually wrapped strips of the dried ham around pieces of melon, but I like this melon salad idea, served in a ham cone. I suggest keeping both the ham and the salad cold until serving time as the ham almost melts when it gets warm. Cut melon in half, scoop into balls with a teaspoon or melon baller. Mix in bowl with oil, lemon juice, vinegar and salt and pepper. Add the carrot and scallion, mix thoroughly and chill for 2 hours. Shape ham slices into cones and serve with melon.